The Regional Conservation Partnership Program brings together a wide array of local and national partners, including Indian tribes, nonprofit organizations, state and local governments, private industry, conservation districts, water districts, universities and many others. So far, more than 2,000 partners are engaged in locally-led conservation efforts through RCPP. The most successful RCPP projects share four common characteristics. They innovate, leverage additional contributions, offer impactful solutions and engage more participants. 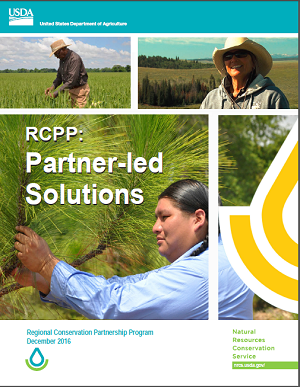 Read more about our partners and download our RCPP: Partner-led Solutions publication. This project seeks to improve water quality within the Baraboo River Watershed in Sauk County and Juneau County in Wisconsin through the promotion and installation of soil and water conservation practices. The partners will target areas which contribute to phosphorus and sediment loading to surface waters. The Baraboo River has been identified as the second greatest contributor of total phosphorus loading to the Wisconsin River, which is a large tributary of the Upper Mississippi River. The Jo Daviess Conservation Foundation and its partners will target areas in the Driftless Area where land restoration and land protection will have the most positive impact on water quality by implementing permanent conservation practices that reduce pollution and sediment runoff into streams. RCPP funding will provide a new comprehensive, targeted regional approach to restoring cold-water streams and their riparian areas for the benefit of the many at-risk species. The project will assist landowners reduce pollution and sediment runoff through the adoption of key conservation practices. Agricultural Conservation Easement Program funding will purchase agricultural conservation easements to install permanent conservation practices such as riparian buffers and filter strips. This project will be the first in Wisconsin to apply groundwater modeling to help deliver conservation practices to the locations in the Central Sands region of Wisconsin which will most effectively address resource needs. The partners will use EQIP to install on-farm practices. Match funding will implement larger scale restoration and municipal and agricultural infrastructure improvements. Project outcomes will be improved instream flows and water quality, increased groundwater recharge, soil conservation, and improved fish and wildlife habitat. This project, led by Tall Pines Conservancy (TPC), will use Agricultural Conservation Easement Program Agricultural Land Easements funding to acquire farmland easements at three different project sites in the watershed. Environmental Quality Incentives Program land practices will mitigate natural resource concerns at each project location. Additionally, Nutrient Management Plans will be developed as needed to identify resource concerns at the project locations. The long-term project goals are to decrease soil reduction; improve habitat quality; and reduce loading of sediments, nutrients, and pollutants into tributaries and lakes in the Oconomowoc River watershed. This will be accomplished by implementation of practices that conserve soil and slow overland flow in agriculture, forestry, and urban areas. NOTE: Conservation Stewardship Program Funding is also available in this project, click here for more information. Our partnership will restore, manage and conserve wildlife habitat for monarch butterflies on agricultural and tribal lands using four main strategies: conservation planning and assessment; habitat improvement and best management practices; building an adequate seed supply for milkweed and nectar plants; and, enhancing organizational coordination and capacity. To provide the greatest conservation outcomes, the project will focus work within two NRCS Critical Conservation Areas: Prairie Grasslands Region and Mississippi River Basin. Targeted areas will be identified through a US Geological Survey-led initiative examining fine-scale opportunities for the restoration of milkweed and other pollinator plants. This project will contribute to national goals in terms of habitat and increase the number of monarch butterflies. This in turn will represent the best opportunity to avoid future regulations related to monarch butterflies from being imposed on farmers and ranchers in the future. The Driftless Area (DA) was bypassed by the last continental glacier and features steep valleys, sandstone bluffs and more than 600 unique spring-fed creeks and ridges once covered in prairie and scattered oaks. This ancient landscape supports a variety of plants and animals, including dozens of uncommon species of birds of woodland and grassland habitats, reptiles and amphibians, and abundant populations of native fish found in the high concentration of cold-water streams. The DA's diversity of habitat provides critical habitat for dozens of species of concern in the State Wildlife Action Plans, and has been cited as one of North America's most important resources. Early agricultural practices that were not suitable for the unique landscape of the DA resulted in severe erosion and sedimentation. Land use practices and conservation efforts have helped heal the land, but the legacy of the past damage is still visible in the valleys and steep stream banks. For the past nine years Trout Unlimited's Driftless Area Restoration Effort has been working with partners to restore structural diversity, ecological function and overall health. This project will provide a new comprehensive, targeted regional approach to restoring prairie, oak woodlands and streams for the benefit of the many at-risk species and abundant concentrations of native species found in the DA landscape. This diverse partnership will implement cost effective conservation solutions that will improve water quality and soil quality along the impaired Milwaukee River corridor. A major tributary to Lake Michigan, the Milwaukee River is plagued with water quality degradation caused in part by high levels of phosphorous and sediment-laden runoff. Project objectives include: 1) recruit landowner participation in EQIP and CSP by promoting EQIP practices through demonstration workshops, agriculture innovation field days and incentives; 2) protect eight properties across 765 acres on priority agricultural lands using ACEP-ALE; and 3) coordinate and facilitate diverse groups - a farmer-led watershed group, working lands group and citizen advisory committee - to educate and promote conservation to farmers.